To verify that the lengths of tangents drawn from an external point are equal. Circle – Set of all points in a plane that are equidistant from a given point called a center of the circle. Radius - The distance from the center to a point on the circle is called the radius of the circle. Two circles are congruent if they have the same radius. A tangent is a line in the plane of a circle that intersects the circle in exactly one point. Tangent Lines to circles from the subject of several theorems, and play an important role in many geometrical constructions and proofs. Since the tangent line to a circle at any point P is perpendicular to the radius to that point, theorems involving tangent lines often involve radial lines and orthogonal circles. It is observed that if two segments from the same exterior point are tangent to the circle, then they are congruent. 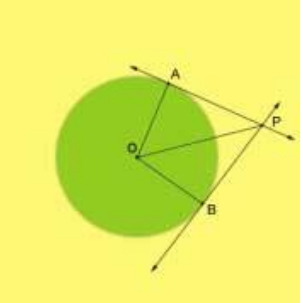 If AP and BP are tangent to a Circle O then AP = BP.